There is actually a machine funnier than the Microfiche | Boostew! 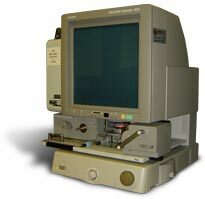 The Microfilm 800! What is it?? Where is it?? Well I returned today wearing an appropriately foxy ensemble to the LAST BASTION OF BEARDIES, otherwise known as the Newspaper Room of the State Library. You bail up bearded man #1, who rolls his eyes extravagantly at your more outlandish requirements, like The Australian Builder newsletter of 1949. He leads you to several rows of tall files, yanks out a drawer and pulls out some battered boxes that look a bit like 16mm film. He then sits you down at a giant screen with several working parts underneath and yanks forward a platen. He then threads the film as you would a projector, under some glass and onto the next reel, flicking some more unnecessary buttons and knobs. The whole thing is whirring, gasping and keening like a cartoon pressure cooker about to explode, which no-one seems to notice. You then push the whole platen under the light, seize the control panel and away you go. Like its slick cousin the Microfiche, it operates on a hair-trigger, so that you can be pondering 1932, then whizz all the way to 1960 without realising. Then spend the next half hour trying to find where you were. Brilliant technology! WHAT YEAR IS THIS FOLKS. IS MY FLUX CAPACITOR ON THE BLINK AGAIN. On my right an old buffer was trying to get his film threaded as well, announcing loudly to the room every thought running through his head: “Look at that……………….why you useless…………………..…..OH YOU DO, DO YOU……………….gngngngn…………………oof…..…..…aha!………..there you go……well done………..oops! Oh no. Back to square one, my friend.” And later, in an undertone, “Not. On. Your. Nellie.” He eventually contented himself by dismantling the mouse of a nearby computer terminal, and we both had an enjoyable gripe about the grottiness of public PCs. On my other side, I got a tap on the shoulder, and a round, beaming gent asked me, “So! What subject are you doing?” I told him I was writing an article, a fact that seemed to go straight over his head. “Me? I’m doing research! Cyclones in the Top End. Yep, look at some of these beauties.” He quickly produced a scrapbook bulging with photocopies of old articles, and enthusiastically pointed out his favourites. “It’s coming into the wet season now you know. That’s when they happen.” He seemed to take quite eager delight in the fact. “See this one – Cyclone Monica? That’s a favourite. Just imagine it. Devastation. You wouldn’t want to be there, eh?” And his mouth became an O, his raised his eyebrows, and gazed at me with delight. We had nothing much more to say to each other after that. So I bumbled around, doing printouts, putting money on my library card, bumbling back again….I got the strongest feeling that the people in the newspaper room had been doing their own thing for several decades, and that I was somehow intruding into a private world of twisted film, whirring, clunking and mis-filed boxes. So I stumped off to have a beer with me pal.